"Be A Hater" is the newest book by Dr. Parham. It takes a cultural examination approach to the role of dissent, relationships, entitlement, millennials, and haters in contemporary society. Using a mix of humor, scholarship, cultural commentary, and personal experience Dr. Parham enlightens readers on the impact of the Hater Mindset on today's culture. Check out the video below for a look at some of the concepts in Dr. Parham's New Book. What do Taylor Swift, Cognitive Psychology, Gucci Mane, Dissent, and The Most Dangerous Person Alive have in common? The answer is the "Hater Mindset". 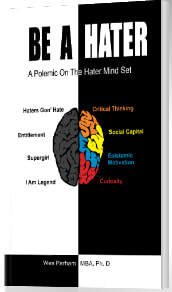 In "Be A Hater" Dr. Parham examines the emergence of the "Hater Mindset" in contemporary culture. Be A Hater delves into a subtle and subconscious cultural shift in the concept of a "hater". The shift from viewing a "hater" as someone trying to hold you back or stop you from succeeding to viewing a "hater" as anyone who disagrees or dissents from your opinion. This shift While Subtle has strong implications for critical thinking, the value of relationships, an individual's happiness, cognitive entitlement, and more. In "Be A Hater" Dr. Parham brings this subconscious shift to the surface and equips the reader to counter its effects by challenging them to "Be A Hater!" What People are Saying about "Be A Hater"
I'm a Hater, Too! Right book. Right time. "Be A Hater" makes us think about how we handle dissent and why it is imperative for us to engage with those who hold differing points of view. Dr. Parham offers a new twist on an old idea, a point of view that is desperately needed in today's culture. The Hater Mindset is the best Jedi mind trick that I have ever seen. Understanding and countering it offers so many opportunities to transform lives, workspaces, and all sorts of relatioships--parental,social, etc.! Every Millennial and anyone who works with, lives with, or engages with Millennials and the following generations needs to read this book. Dr. Parham gives fresh insight on how the term "haters" is impacting the very core of how community and culture view and respond to criticsm and disagreement. This work is thoughtful and engaging.